In this tutorial, we'll learn how to apply filter effects to live, editable type in Photoshop by taking advantage of Smart Objects and Smart Filters! I'll be using Photoshop CC. Photoshop has lots of powerful features for working with type, but one thing we can't do is apply filters to Type layers. That's because Photoshop's filters are designed for manipulating pixels, and type in Photoshop is made from vectors. That's a shame, because if we could somehow apply filters to our type, it would unlock a world of creative possibilities. If only there was some way to do it. Thankfully, as we'll see in this tutorial, there is! In fact, there's a couple of ways, but one way is definitely better than the other. The classic, old school way of applying filters to type is to first rasterize the Type layer, which means converting it from vectors into pixels. Since filters are designed to work with pixels, we can then apply any filters we like to the text. But there's a couple of drawbacks to this approach. The main problem is that once we've converted the Type layer into pixels, the text is no longer editable. And, whenever we apply filters to normal, pixel-based layers, the filters are applied as static effects, which means that like the text itself, they're not editable after we've applied them. A better way to apply filters to type is to convert the Type layer into a Smart Object. A Smart Object is like a virtual container that holds the Type layer inside of it. Anything we do at that point is done not to the Type layer itself but to the Smart Object surrounding it. 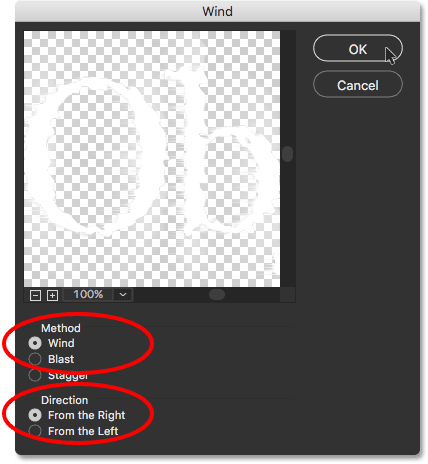 Photoshop lets us apply most of its filters to Smart Objects, all while keeping the Type layer inside fully editable. And, whenever we apply filters to Smart Objects, they're applied not as static effects but as Smart Filters! 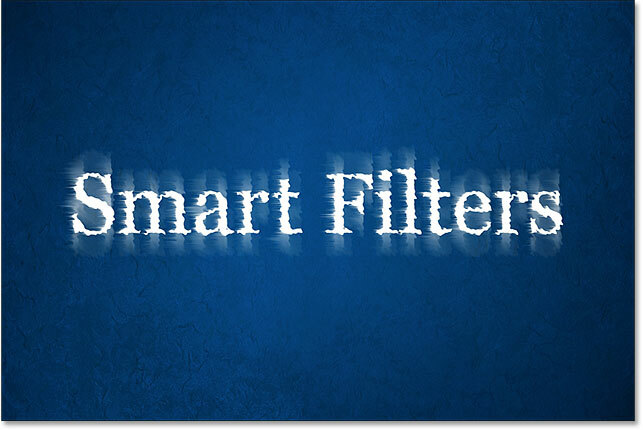 What's a Smart Filter? 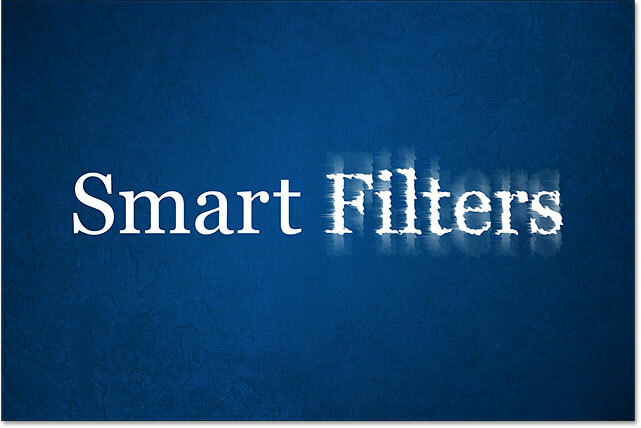 In many ways, a Smart Filter is just like a normal filter, except that it remains fully editable even after we apply it. 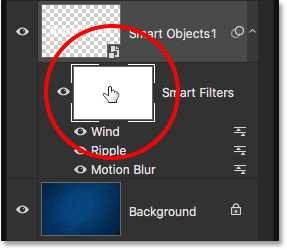 We can go back at any time, re-open the Smart Filter's dialog box and try different settings without any loss in quality, and without making permanent changes to the image (or in this case, to the type). Smart Filters have other features, too. 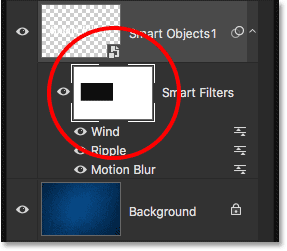 We can turn Smart Filters on and off, apply multiple Smart Filters to the same Smart Object, and even change a Smart Filter's blend mode and opacity independently of the Smart Object itself. And, Smart Filters come with a built-in layer mask in case we don't want the effect(s) to be applied to the entire text. We'll be looking at all of these features throughout this tutorial. 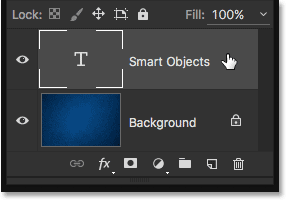 Smart Objects and Smart Filters are two of the most powerful features in Photoshop, and when combined with Type layers, there's no limit to what we can do. Let's see how it works! 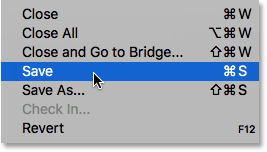 A simple document open in Photoshop. 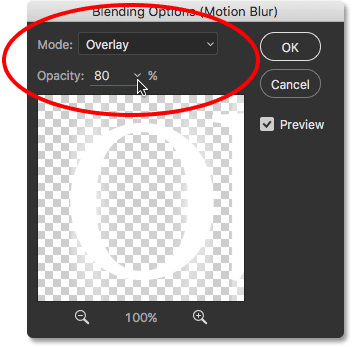 The Layers panel showing the Type layer separate from the background image. 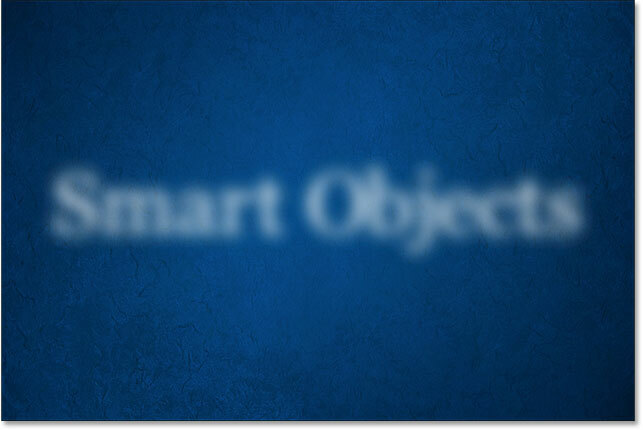 As soon as I choose "Convert To Smart Object", the Gaussian Blur filter's dialog box opens. But before we look at it, let's look again in the Layers panel to see what just happened in the background. 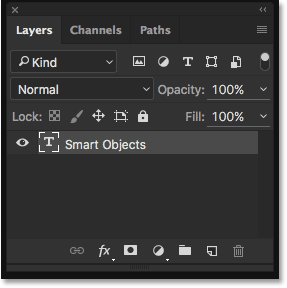 The Layers panel showing the Type layer converted to a Smart Object. 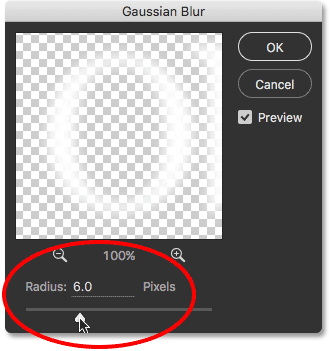 Setting the Radius value in the Gaussian Blur dialog box. The type after applying Gaussian Blur. Now that I've applied the Gaussian Blur filter, what if I decide that I need to change the blur amount? If I had simply rasterized the text and then applied Gaussian Blur directly to the pixel-based layer, the filter would not be editable at this point. The only way I could change the blur amount would be to either re-apply the filter over top of my initial blur effect (which means I'd be blurring the already-blurred text), or I would need to undo my last step and then re-apply the filter with a different setting. 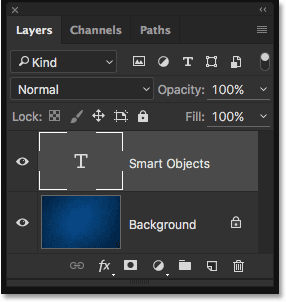 The Layers panel showing the Gaussian Blur Smart Filter. That's really all there is to applying filters as Smart Filters in Photoshop. 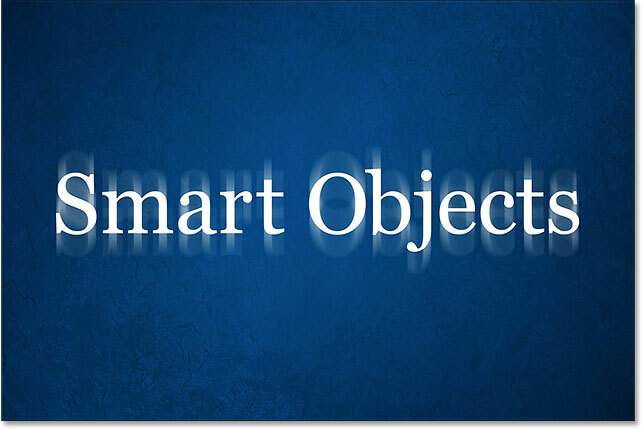 We simply need to convert the layer into a Smart Object first, and then apply the filter to the Smart Object. Photoshop will automatically convert it into a Smart Filter. 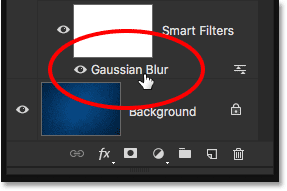 Double-clicking on the Gaussian Blur Smart Filter. This re-opens the filter's dialog box to the settings that are currently being used (in my case, a Radius value of 6 pixels). Notice that I said the settings that are "currently being used", and that's because Smart Filters are entirely non-destructive. My Gaussian Blur filter wasn't actually applied to the type the way a normal filter would be permanently applied to a pixel-based layer. 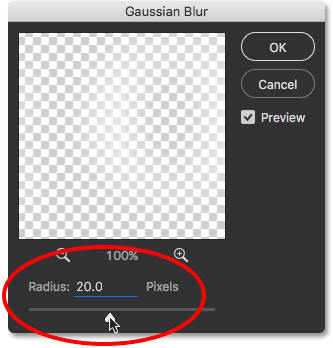 Instead, Photoshop is simply showing us a live preview of what the type looks like using my current Gaussian Blur settings. And because it's just a preview, we can change the settings at any time. The effect after increasing the Gaussian Blur's Radius value. 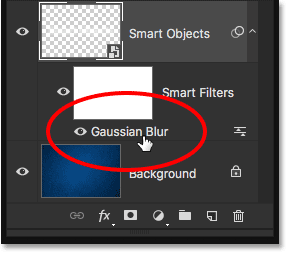 Double-clicking again on the Gaussian Blur Smart Filter. 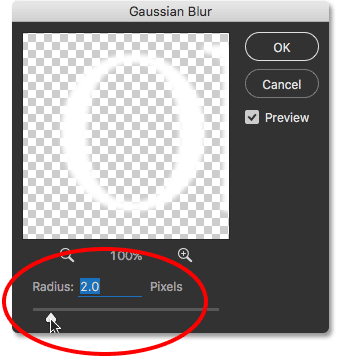 Lowering the Radius value to 2 pixels. The effect after decreasing the Radius value. Going to Edit > Undo Edit Filter Effect (Gaussian Blur). The text is back to the previous blur amount after undoing the last Gaussian Blur edit. 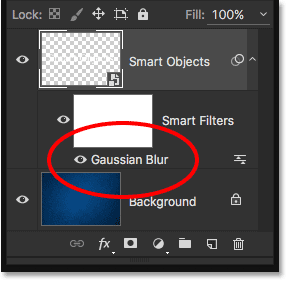 Clicking the Gaussian Blur Smart Filter's visibility icon. Turning the Gaussian Blur Smart Filter back on. Turning the filter back on brings back the blur effect. 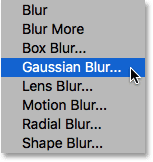 What if I decide I don't need the Gaussian Blur filter at all? I could just turn it off by clicking its visibility icon like I did a moment ago, but if I really don't need it, I can just get rid of it. 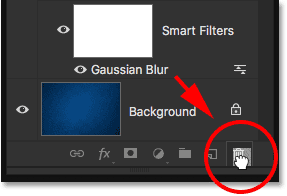 Right-clicking (Win) / Control-clicking (Mac) on the Gaussian Blur filter and choosing Delete Smart Filter. Dragging the Gaussian Blur Smart Filter into the trash. 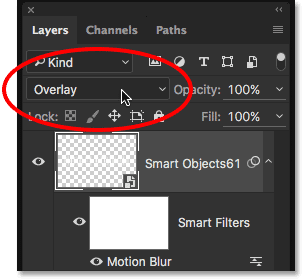 The Layers panel after deleting the Smart Filter. The type after deleting the Smart Filter. This time, Photoshop doesn't warn me about first needing to either rasterize the Type layer or convert it to a Smart Object, and that's because it was already converted to a Smart Object back when I applied the Gaussian Blur filter. Instead, Photoshop goes ahead and opens the Motion Blur filter's dialog box. The Motion Blur dialog box. The text after applying the Motion Blur filter. The Layers panel showing the new Motion Blur Smart Filter. Changing the blend mode of the text to Overlay. 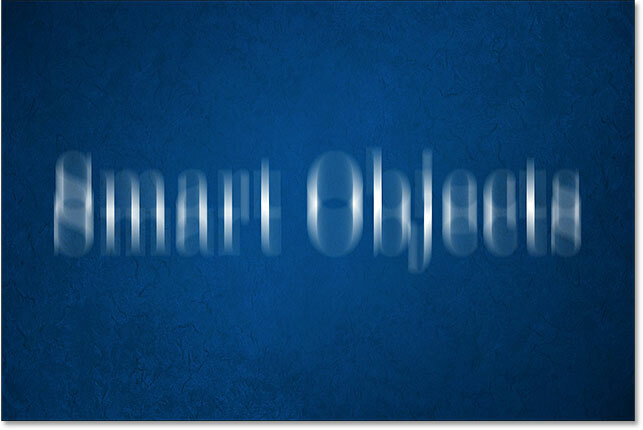 The result after changing the Smart Object's blend mode to Overlay. 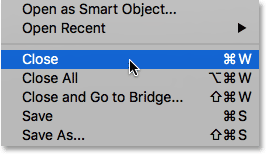 Setting the Smart Object's blend mode to Normal. The text with the blend mode set to Normal. 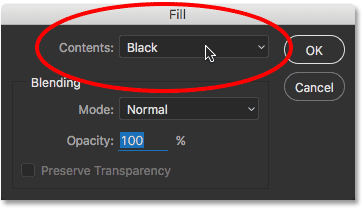 This opens the Blending Options dialog box, with the same blend mode and opacity options at the top that we would find in the Layers panel. The difference here is that these options will affect only the Smart Filter, not the contents of the Smart Object. 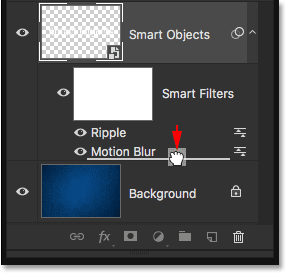 The Smart Filter's Blending Options dialog box. The effect after changing the blend mode and opacity of the Motion Blur Smart Filter. Changing the Smart Object's blend mode back to Overlay. 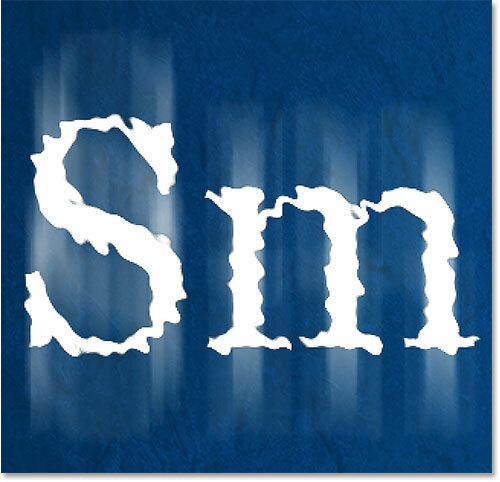 The effect with the Motion Blur filter and the type both set to the Overlay blend mode. Changing the Smart Object's blend mode back to Normal. The background is no longer showing through the letters. 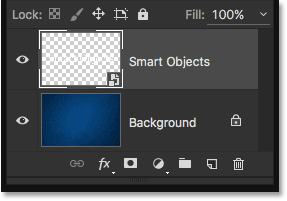 So far, we've learned that to apply a Smart Filter to type in Photoshop, we first need to convert the Type layer into a Smart Object, at which point any filter we apply to it automatically becomes a Smart Filter. We've seen how to apply a single Smart Filter, but we can also apply multiple Smart Filters to the same Smart Object. Going to Filter > Distort > Ripple. 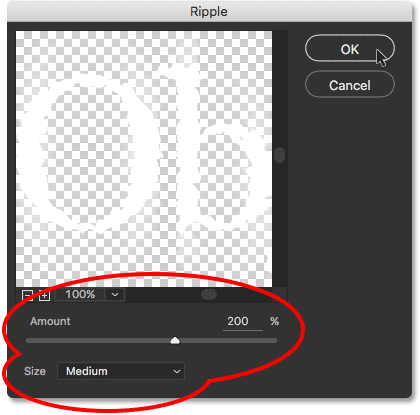 The Ripple filter dialog box. The result after applying the Ripple filter along with the Motion Blur filter. 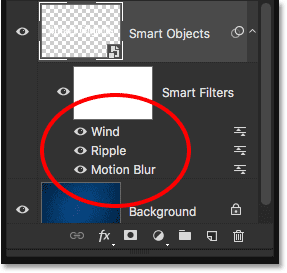 The Layers panel showing the new Ripple Smart Filter. The order in which the Smart Filters are listed is important. That's because Photoshop applies the filters from the bottom up. In this case, it means that the Motion Blur filter is being applied to the type first (since it's the one at the bottom of the list) and then Ripple is applied after. The Ripple filter is affecting both the type and the motion blur. 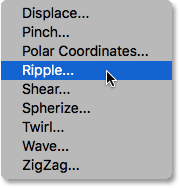 Clicking and dragging Ripple below Motion Blur. The order of the Smart Filters has changed. This time, Ripple is applied first, and then Motion Blur on top of it. Going to Edit > Undo Move Filter Effect. 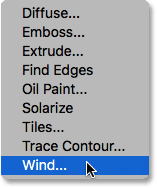 The Wind filter's dialog box. The effect after adding the Wind filter into the mix. The Layers panel showing all three Smart Filters being applied to the type. Even with three Smart Filters being applied to it, the text inside the Smart Object remains fully editable. 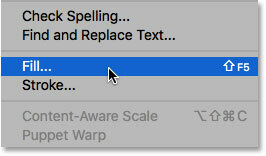 The only issue that may cause a bit of confusion at first is that we can't simply grab the Type Tool, click on the text in the document and then edit it the way we normally would. That's because the text is sitting inside the Smart Object, so to get to the text, we first need to open the Smart Object. Double-clicking on the Smart Object's thumbnail. The type appears in a document that's separate from the main document. Highlighting part of the text. The text remains fully editable even with multiple Smart Filters applied. One last but important feature of Smart Filters in Photoshop is that they come with a built-in layer mask, which lets us isolate the filter effects to just a certain part of the text. 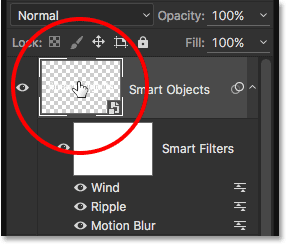 If we look in the Layers panel, we can see the white-filled layer mask thumbnail directly above the list of Smart Filters. All filters in the list share the same mask. 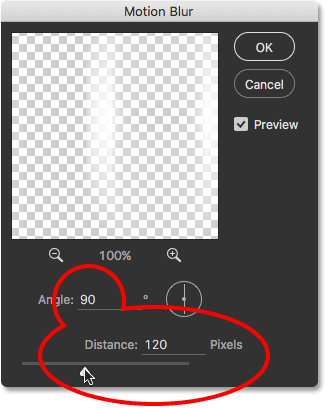 Clicking the layer mask thumbnail. You can learn all about layer masks in our Understanding Layer Masks In Photoshop tutorial, but in short, the way the mask works is that areas filled with white on the mask are the areas where the effects of the Smart Filters are visible in the document. At the moment, as we can see in the thumbnail, the entire mask is filled with white, which is why we can see the filter effects across the entire text. Dragging a selection around the area where I want to hide the Smart Filters. The layer mask made it easy to hide the effects over part of the text. The black area on the mask is where the filter effects are no longer visible in the document. And there we have it! 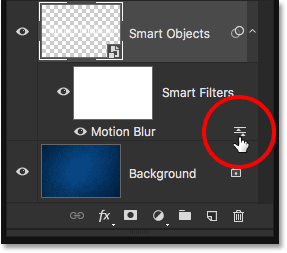 That's our detailed look at how to apply filter effects to live, editable type in Photoshop using the non-destructive power of Smart Filters! For another related tutorial, check out How To Transform Type With Smart Objects In Photoshop! Or visit our Photoshop Basics section to learn more about Photoshop!